Statistics reveal that churched families are not immune to abuse in the home, but few people dare to talk about it. Sometimes abuse doesn't even show because there are no bruises or black eyes or knocked-out teeth. Still, many women connected to the Church are repeatedly subjected to verbal assault, emotional terrorism, financial tyranny or demeaning sexual behavior. "But he never hits me," does not make these abuses okay and is no excuse for the equally—or perhaps even greater—damaging trauma of invisible abuse. Battered without Bruises dares to talk about it. It is the gripping account of one woman's emotional and psychological battering by her husband and the inspiring insights for life she gained from that experience. The above words are on the Amazon website—don’t know who wrote them but they are a good description. An extremely well-written account of the author’s experience of living with an abusive husband who appeared to others as the epitome of a fine Christian gentleman. Their courtship lasted 4 years and during that time, there appeared to be no reason for Marjorie to believe their marriage would be anything less than harmonious. However, from the very first night they were living together, she discovered her new husband had another side to his personality which had not been evident before. The author spends some time describing her childhood, which though not at all abusive, did not prepare her for what lay ahead. Neither did her church involvement, which confirmed that women were designed to be submissive to men and that it was her responsibility to respond and react to her husband’s abuse in ways which would hopefully improve their situation. The variety of ways in which her husband demeaned her is outlined along with her attempts to adjust, which often only seemed to make things worse. This was not an immature woman with limited life experience, but an accomplished person with a responsible position at work who found herself conflicted on many levels. 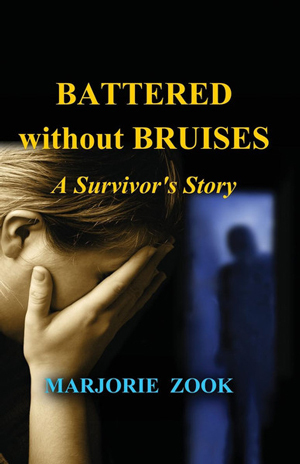 This book will be helpful to women enduring abuse and wondering if they should call it by that name, and also for women who are going through the recovery process after leaving an abusive situation. There is so much practical advice and honest exposure of self-doubt and vulnerability while attempting to recognize the truth of what was happening. The response and reaction of her local church is outlined, showing how people in abusive homes can be extremely isolated and bereft of comfort and understanding. This heartfelt account is practical yet not clinical and without a trace of bitterness. How Marjorie recovered from this ordeal of many years will be of great encouragement to those who need courage while recognizing what is happening to them and taking steps towards full spiritual and emotional health.